Anyone familiar with advanced electronic cigarettes can’t help but notice some similarities between Volcano’s Lavatube and the reigning flagship e-cig, the Provari. I’ve written both a ProVari review and a Lavatube review as well as a review of the newest Lavatube, the Stainless Steel VTube from Apollo. I struggled quite a bit to avoid making the original Lavatube review into a Lavatube vs. ProVari comparison. That particular e-cigarette review has been written and more people have had a chance to experience the Lavatube. So, now would be a good time to do a review comparing the ProVari and Lavatube. Note: this review has been updated to reflect the changes in the new ProVari V2. From a size standpoint, neither device would be considered small by any stretch. Both e-cigarettes are large devices. 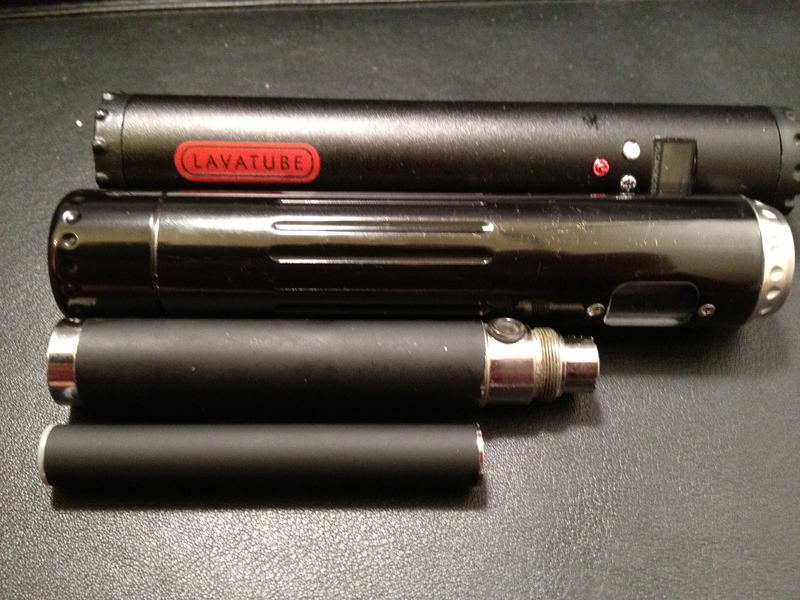 The Lavatube is very slightly thinner and taller than the ProVari. 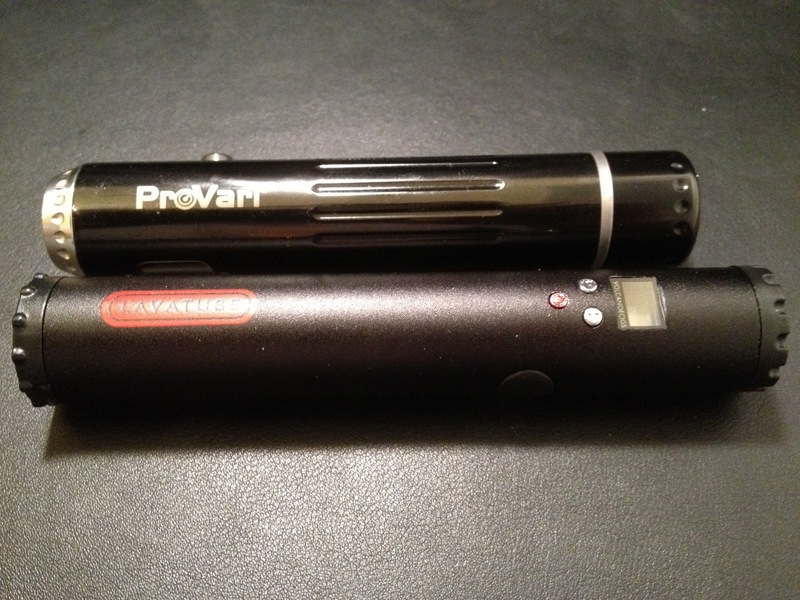 How much taller depends on which options the ProVari is configured with. The Lavatube has one battery option, a sizable IMR 18650 battery. The ProVari in contrast is much more flexible. In its base configuration, it takes smaller 18490 batteries. Adding a special endcap to the device allows it to use 18650 batteries at the cost of additional length. A third battery option, the ProVari Power is a slightly larger battery that increases the length of the device by another 1/8 inch. Despite the slightly larger size, the Lavatube is a featherweight compared to the ProVari. The reason for this is the ProVari is constructed from stainless steel while the Lavatube is built from aluminum. 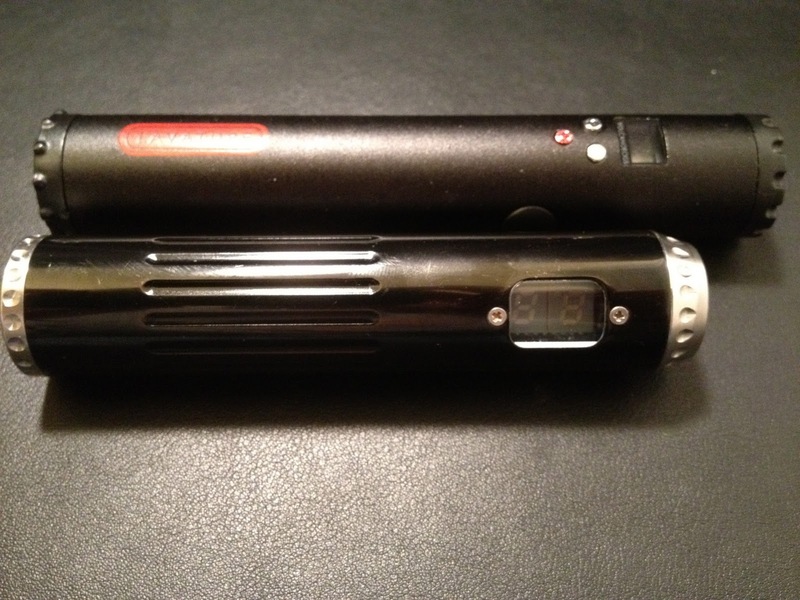 The Lavatube’s weight helps the device feel smaller when in use. The general design of both devices is fairly similar. The fit and finish department is where the ProVari really separates itself from the lower-end Lavatube. This isn’t that surprising, the ProVari is a high-end device, whereas the Lavatube is more of an entry level contender in this space. The Lavatube despite its lower-end roots, does not feel flimsy. The finish on the device is well done, and there are no glaring design defects. The paint finish is good on the Lavatube, but the endcaps are plastic instead of aluminum or steel, and the main button works well, but has a decidedly low-end hard plastic feel to it. In contract, the ProVari feels a lot like comparing an economy car with a high end luxury sedan. The fire button while also plastic, is illuminated and has a softer feel to the plastic. The end cap screws on with a fluid action rarely seen on other devices. I sort of use that as the gold standard against which I compare all other devices’ end caps. A number of other small touches also add to the ProVari’s high-rent feel. The fluting along the sides of the device and the much better executed knurling of the endcaps are two prime examples. The fact that the ProVari is also available in a gold plated model doesn’t hurt its reputation as the e-cigarette for the monocle and top hat crowd. The overwhelming similarity in feature sets between the ProVari and the Lavatube is of course the reason for this review in the first place. Both devices feature variable voltage between 3 and 6 volts adjustable in .1v increments. Each device also features an LED readout screen that displays key information such as the current setting. 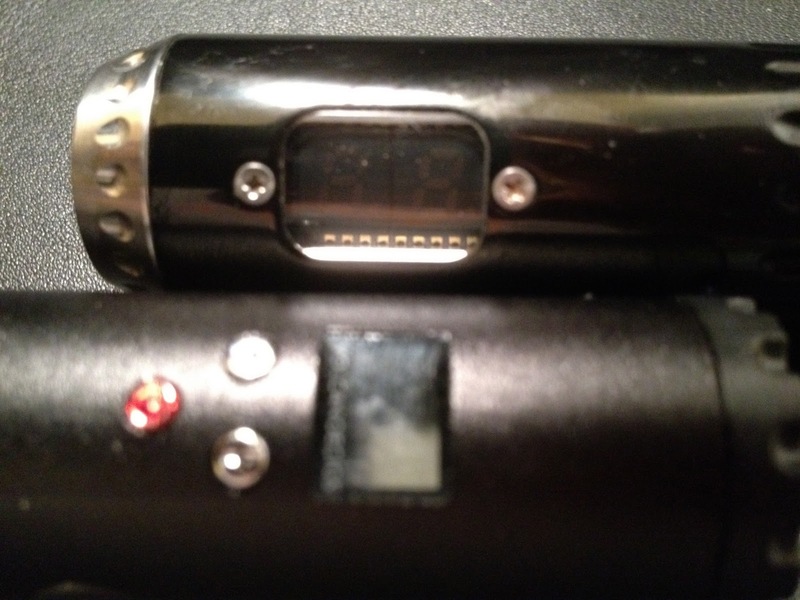 The Lavatube’s screen is a little on the small side when compared to the ProVari’s screen. The makers of the ProVari also recently announced their device will be available with an optional blue display. The default color, like that in the Lavatube is red. 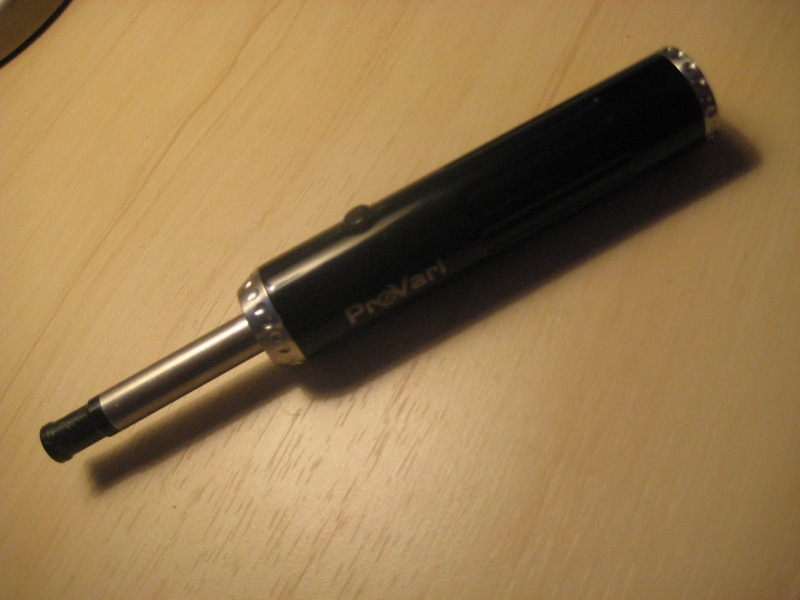 The ProVari uses a single button to handle both activating the device along with all of the other features. A series of button presses accesses the various menu items. 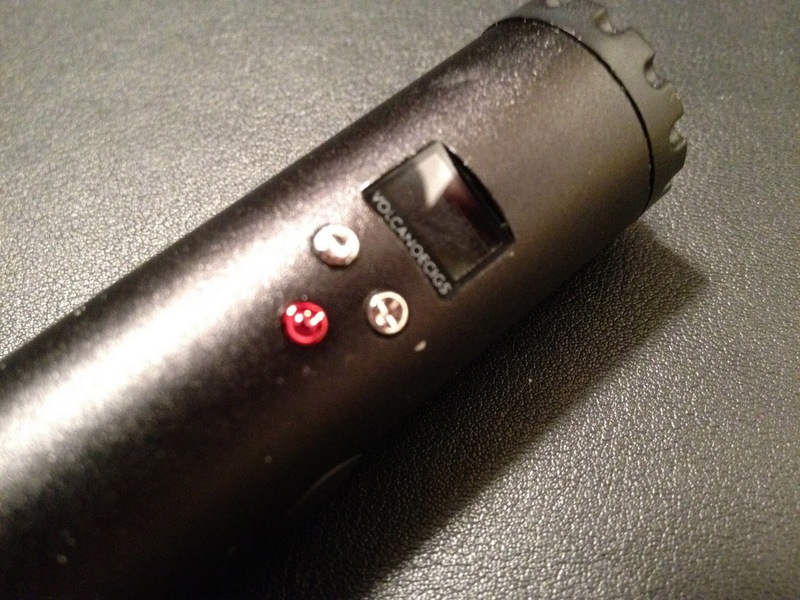 The Lavatube uses a series of three function buttons, + – and a power button. This provides more simple operation for most key features, although there are a couple of features such as battery level check and button lock that require a combination of presses. Battery levels, power toggle and button lock are all available in the ProVari using the button menus. 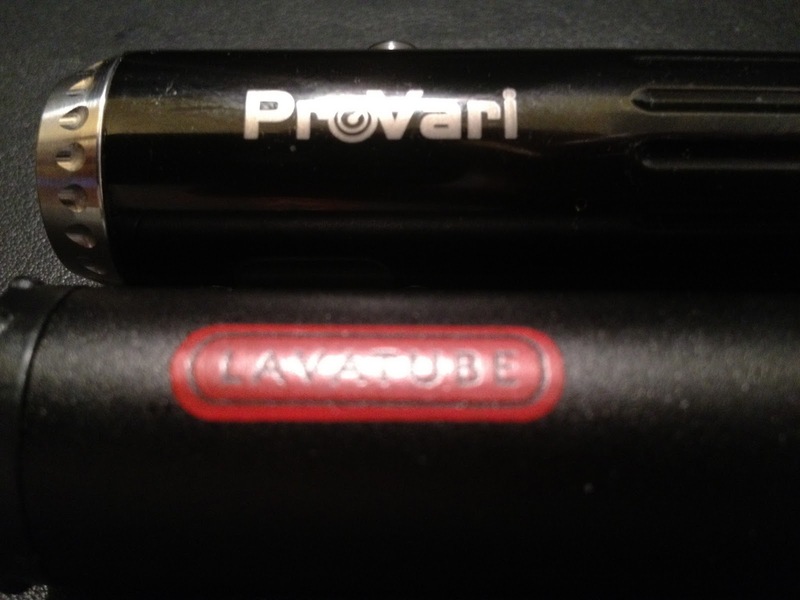 The ProVari also offers a feature in its menu system the Lavatube doesn’t. The ProVari has a feature that displays the currently connected atomizer’s resistance in ohms. It’s a seemingly obscure feature, but I find myself using it regularly. Both devices also have self-protection circuitry built in for conditions such as a short circuit, overheating or over-amperage. The ProVari displays an error code that is linked to a specific fault condition while the Lavatube isn’t quite as verbose in its errors. The two also have different approaches to over-amperage conditions. These tend to occur when the voltage is set too high for the resistance of the attached cartomizer. The ProVari simply shuts off and displays the relevant error code. The Lavatube simply lowers the voltage to 3.7 v and keeps on chugging along with no indication an error occurred. The Volcano device’s way of handling things sort of throws the performance of the device slightly in my mind. Without knowing at what point the protection circuit is activated, it makes pushing the device to the edge of the performance curve somewhat difficult. The ProVari makes things more simple since finding the highest possible voltage setting is just a matter of backing down the voltage until the errors go away. The ProVari has a higher amperage limit. This allows the device to push lower resistance cartomizers at higher voltages. This gives the ProVari an overwhelming advantage when using dual coil cartomizers. Knowing when the protection circuitry kicks in also gives the ProVari the upper hand in real-world use conditions. In theoretical conditions, the ProVari also has a small performance advantage due to cut-off times. The Volcano’s stated cutoff time is 10 seconds (my unit cuts off after 15). ProVari will cut you off after 16 seconds. Going with the stated times, in theory a draw of 16 seconds longer should produce considerably more vapor. In reality, this is probably an edge case, but if you need 16 second cutoff times, you know who you are. Similarities between the two devices continue in the warranty department. Both devices come with a one year warranty. Should something go awry, send the device back and they’ll repair it or send you a replacement. Shipping to the company is on your dime. The ProVari also has an optional 1 year extended warranty, extending the warranty period to two years. There was some controversy over Volcano’s warranty during the pre-order phase. The company originally stated it was the same as their warranties for their other devices. This means that if the device was damaged due to a non-volcano atomizer, the warranty would be voided. The company has since stepped back from that stance noting that the protection circuitry should protect the device from these conditions unlike their standard batteries. Where the two devices really separate themselves is the price. The Lavatube is nearly half the price of the ProVari. The price is even less than that when the ProVari is configured with the extended battery cap or any extra goodies like gold plating. Clearly, the Lavatube was built to compete directly with the ProVari on price. The Lavatube actually surprised me with its quality when I received the unit. It lacks some of the finesse and polish of the ProVari or the dual coil performance enabled by the ProVari V2 update, but the Lavatube is far from a junky device. Apollo Electronic Cigarettes announced a stainless steel version of the Lavatube, which might level the playing field as far as fit and finish are concerned. If money were no object, or if you are looking for more of a luxury choice, the ProVari is hands-down the winner of this e-cigarette comparison. There is no question of which device to choose if are a dual coil cartomizer fan either. The ProVari continues to be the Cadillac of e-cigarettes. However, the Lavatube is hard to ignore with its incredibly attractive pricing. Essentially, the Lavatube gives you about 90% of what the ProVari provides for about half the price. For a lot of people these days, that’s a pretty compelling reason to take a good look at the Lavatube. Since the original writing of this review, the Lavatube has become available to many vendors. Some may offer the device at an even more affordable price. Two of the best sites I’ve found are Vape Dudes, Apollo eCigs and Vapor Alley. Check each site for prices and availability as they are frequently out of stock. Something difficult to discern on these deluxe e-cigs with variable voltages and additional buttons, as I was looking through the adverts yesterday, but w/o them showing the image of a hand or a ruler in the picture, it is hard to imagine how they would look and feel, if they are rather large or rather fat. There is nothing to compare back to in the photos to indicate how they relate in size to other e-cigs or to the human hand. Just a comment, but the impression I was left with when looking through the adverts and catalogue postings for these devices. You make a good point. I believe both the individual reviews for the devices have a picture next to a regular 650mAh eGo to give them some sense of scale. I'll see about adding another picture into this review to help provide an idea of scale. I also have both a Provari and Lavatube. The Provari is defiantly the better built of the 2, and has been my goto device with a 2.5 ohm dual coil tank and it worked exceptionally well. I received the Lavatube yesterday and would recommend it to a user that want's to try variable voltage at a lower price point. I found it to be unacceptable with low resistance atomizers however and am now dripping with a cisco 2.5 ohm 510. I got the Lavatube to replace my old faithful Prodigy V1 which was finally killed by a shorted 1.5 ohm dual coil cart, and yes I'm happy with the purchase. That's kind of how I feel as well, the ProVari is all around better, for a price, though I don't really use dual coils on either usually. I've been playing with a new 3 ohm dual coil carto @ 6v. I've found the 2.5 dual coil cartos to work well around 5.3 volts. That's whats on my Provari 90% of the time. But still love the fast of dripping, and do that on my Helix at 3.7 and the Lavatube. The original Puresmoker Prodigy had a electronic switch that would blow pretty easily, I've replaced it 3 times already, but am now out of switches. So it will finally rest. The new ones are indestructible. Use a Prodigy V3 at 6v on a dual coil tank daily. Most of the dualies I have are the 1.5 ohm, so I pretty much use them on other stuff, or more frequently I prefer the 1.7 single coils which work fine at under 4v. I have to admit, I never read instructions so I never looked online for any :) This was a sort of pre-release kit so it didn't come with any kind of retail packaging, just some stuff tossed in an envelope. I know ProVape has moved to PDF directions on their site. Hopefully Volcano can put some up there as well. A few things aren't that well documented like the battery indicator and lock features, as well as the protection step-down. I disagree that Provari throwing an error if you try to over amp it is better than the Lava Tubes automatic downgrading function. With the Lava Tube, you can just set it to 6v and use various atomisers and always know you are pushing it to the max withought having to touch it again, with the Provari though you have to start and 6 and keep downstepping until you find the highest setting it will run on without throwing an error, you then have to do with with all your different atties and remember each one's limits to achieve the same thing. The only caveat is the fact the LT doesn't tell you what the max voltage is and so it 'looks' like you are running at 6 but in reality it will be lower. But if in a future realease it flashed and automatically changed so you could see it, it would definately be better than the 'err' system on the Provari, especially given the silly one button design with it's fiddly 'press this 12 times', 'press it again 4 times' system you have to use to change your settings on the pro. Interesting idea I hadn't thought about it, and the single button setup on the ProVari can be awkward at times. The problem in letting the Lavatube choose the voltage is that it doesn't back off in small increments. It seems to have certain set points. So for example if you are set at 6v and your atomizer would be fine at 4.3v, the Lavatube would end up backing it down all the way to 3.7v since that's the nearest point. If I had the ability to make the lavatube my way, I'd say a good solution would be to make the step down go to the nearest safe voltage and turn on the display showing what voltage has been selected. Actually steve. I have been doing some tests and found when using a 1.8-2.0 ohm atty set at anything over 4.5-4.6 volts on a fresh battery is when the regulatiraon would step in and bring it down to to 4.3 or 4.4. Using it at 4.4 it is giving 4.4 which is my sweet spot for the dripping atty made by vision. I also noticed that when using a single dual coil at anything above 4V I was getting 3.93. Using a 3 ohm atty(the one that came with it from canvape.com(2 batts, 2 atties, case DT and dual batt trustfire charger) 69.99 CND. Yes that is right. Canvape states it to be 2.5 ohm but I never thought to check until now, just figured it was the stock 3 ohm one. I found on a fresh batt at 6V I was getting 5.8v going down to 5.6 at 3.9v on actually battery charge and staying there tell about 3.5 I always replace at 3.5 So I don't know any lower. Also one more feature(most think is pointless, but I am testing a theory that will make it very useful if it proves true). is if you press button 7 times to get batt voltage, then hold fire button, and push bower button one more time, you will get the loaded voltage of the actual battery. ie. at 6 volts, the loaded voltage of the IMR is 3.0-3.1volts Set at 4.2 the loaded voltage is 3.7 of the actual battery/not the stepped down voltage. Ok, that hidden feature is awesome! At least to me :) I did some testing to see if it may have been showing the voltage output factoring in the protection circuitry, but it looks like it is just battery voltage under load. Still cool, it's always hard to get that reading. If only it could read atomizer resistance like the ProVari. That's a feature I use a lot myself. Using my friends meter, don't have my own so can't check atty voltage till later or maybe tommorow. I know what you mean. Well my theory is this. Start with a 2 ohm atty at say 3.7 volts. check battery under load. Keep increasing voltage until, the batterry underload doesn't change any more. for the 1.8 ohm atty is was 4.4-4.6 usually 4.6 . So any higher then that the batt still said 3.3 underoad. So when I backed it down to 4.3 or 4.4 it read 3.4 underload. So although it is a bit complicated. It has allowed me to find the max voltage I can use whatever atty/carto at. I hope that makes sense hit me up at maxstilson@hotmail.com to discuss further. P.S. I have a feeling there may be a way to test ohms of atty using unique button presses. Like the battery underload is not supposed to be known. It is for the manufacturer to do QC. They have known underload voltages and must make sure the capicitors that are in the unit are working fine. I also wanted to throw this out there. The Circuitry for the Provari is made in china, I have also heard the steel parts are but cannot get a guarantee, but I have a guarantee the provari circuit board and led are chinese made. It is "assembled in the U.S". Tricky laws allow assembled to be said as made. Also. A new Lavatube is due out in July-August rumours are that is will have a 3 -4 amp limit and show the actual voltage when it becomes stepped down. I was told it will actually step down the voltage and leave it there. Which is what everyone wants. I want 3 or 4 amps. Still the lavatube is what introduced me to variable voltage. I liked 5 volts back in 2009 but, atty quality sucked and they blew big time. Vaped an Ego Pt with Lr 1.5 atties for the last 2 years. Now that I have lavatube, my ego feels whimpy. lol. When I first got it I was too shocked at the quality. Although my minus button is very clicky. My power and + button are not as clicky. They only click when push with fingernail. With my thumb no noise. Still minor gripes for the vape it provides, now I am just waiting on my halo. Sick of dekang dumaurier and RY4. I know the feeling, I used to love my eGo (one of my first posts here was to profess my undying love for my eGo). Now… not so much :) I do have an eGo-C en route to check out and do a review, see how that fares. what do you think of my maxing the voltage theory? I am unsure of Ego-C now. There is joye, bauway, and Mit/royal smokers ego-c. Which is best? I don't know. I can get attys for 5$ so unless it is so much better it is pointless. Maybe if the inserts were like 2$ a pop. I still have to do some more testing with different resistance cartos to try and get a feel for what it's really showing, but I think you are on the right track. Not sure how I managed to miss this review along with the comments. Has answered a few questions as to the difference between the P and LT. I heard a rumor that a V2 upgrade is in the works on the Lavatube giving it both an ohm readout and a 3.5 amp switch like the V2 ProVari. That should make things interesting. I need to test this, but there's been a lot of buzz lately that the Lavatube has a hard time holding the volts steady as the battery gets low. Mine held 6v under load with an Iken 3.5ohm IO6 atty but started dropping as the battery started draining. What with being a single battery unit about the only real advantage Lavatube has is the ease of changing the volts up or down with just a couple of clicks to find your sweet spot on low demand vaporizers. Did you get a V2 Provari ordered? Will be anxiously waiting to see how it holds it's voltage with high demand vaporizers. Question : I can see long 18650 (protected) on one of your pics. It would be very useful for 100s of us to clarify one thing. 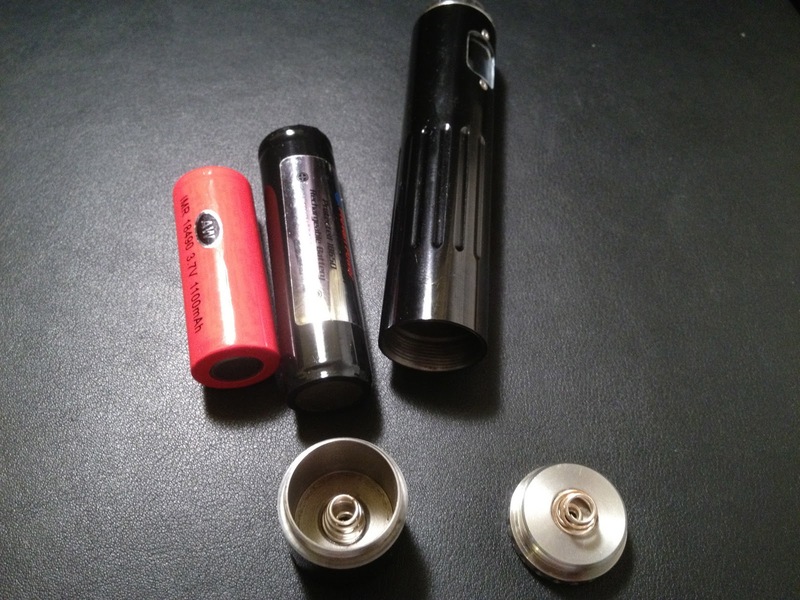 Which exact batteries (button top, flat, size) will fit in Lavatube, and which in ProVari. There are new batteries on the market (very powerful), CGR18650CH Panasonic 10A 2250mAh, and NCR18650A 3100mAh protected version. But, nobody knows which 18650 battery size will actually fit (physically). It would be very useful if you give us more info on protected version 18650 that you have on your picture. Good question… IMRs are recommended for both. The Lavatube is more flexible and can work with most flat top or button top IMRs. The ProVari is much pickier and pretty much needs a button top IMR. That holds true for both 18650s and 18490's. I bought a couple of 18490's with my Kick only to find out they wouldn't work in the ProVari and I had to order a couple button tops for it. Protected batteries won't fit in the Lavatube in general because they're too tall. 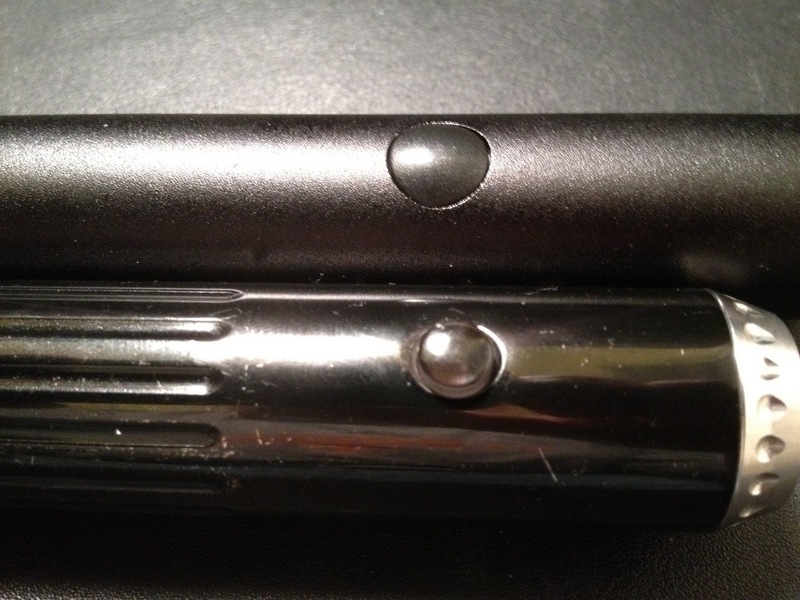 The ProVari can house a protected button top battery with a small gap between the body and extended end cap. There is a new "improved" lavatube clone over at Apollo ready for pre-order. Solid stainless, to boot. Have you heard anything about this new version, like what type of non-case improvements it may have? I've ordered one of these in solid stainless and a new ProVari, both of them birthday gifts to myself :p, and I can't wait to get them both here to play with. I saw that they have a stainless model coming in, which should help it feel much sturdier. I don't know what if any internal changes though. I heard there was going to be an update to the LT to give it a 3.5a capacity like the ProVari as well as the ability to read the carto resistance, but so far I haven't heard anything concrete. I know a lot of people in my office use http://www.dfwvapor.com to buy vaping stuff. They seem really happy with it. I'm thinking about getting one myself. I ordered 2 lava tubes about 6 months ago from volcano. They have worked well, the problem is they are just not constructed well enough to survive the rigors of a device the gets so much use. Things like getting dropped or sat on or dumped in a purse take their toll and the collar cracks and the place where the brass female thread is just pressed into this plastic collar and becomes the weakest link of this unit. Both units have failed in this way. The electrical connection between the brass fitting and the main body breaks and the unit is doomed. If not for daily use and abuse, it is a great.